The House of Staunton Fitted Coffer in splendid Bird's Eye Maple provides the highest level of protection for your chessmen. Unlike traditional chess boxes, where the chess pieces are stacked on top of each other while not in use, the large Fitted Coffer provides each of the chess pieces their own individual storage compartment. 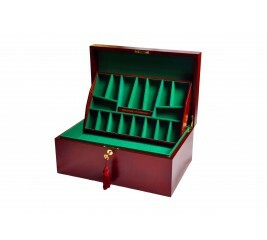 It features brass quadrant hinges, two removable trays and a lock and key with tassel. Available with or without The House of Staunton Logo laser engraved on the lid. This item can also be personalized for gift giving. The House of Staunton Fitted Coffer in splendid Mahogany provides the highest level of protection for your chessmen. Unlike traditional chess boxes, where the chess pieces are stacked on top of each other while not in use, the large Fitted Coffer provides each of the chess pieces their own individual storage compartment. It features brass quadrant hinges, two removable trays and a lock and key with tassel. Available with or without The House of Staunton Logo laser engraved on the lid. This item can also be personalized for gift giving. The House of Staunton Fitted Coffer in splendid Red Burl provides the highest level of protection for your chessmen. Unlike traditional chess boxes, where the chess pieces are stacked on top of each other while not in use, the large Fitted Coffer provides each of the chess pieces their own individual storage compartment. It features brass quadrant hinges, two removable trays and a lock and key with tassel. Available with or without The House of Staunton Logo laser engraved on the lid. This item can also be personalized for gift giving.